The vascular return relies on 2 systemic systems, the venous system and the lymphatic system. The 2 systems are both divided in 2 sub-systems, the superficial one and the deep one. Contrary to the venous system where the deep one is the preponderant sub-system (over 85% of the lower extremity venous return flows through the deep veins), the lymphatic circulation relies mostly on the superficial sub-system. The muscular contraction is a commonly accepted benefit to the deep venous return. However, the muscular contraction is almost inefficient on the lymphatic circulation. Indeed, the main lymphatic flow, superficial or extra-fascicular, is unaffected by the muscular contraction pulses. 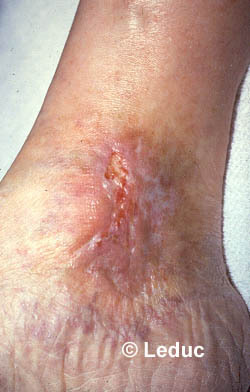 The superficial venous drainage of the lower extremities communicates with the deep veins through multiple perforating branches. 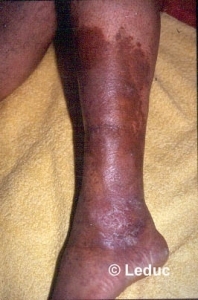 Therefore, deep venous insufficiencies have a considerable effect on the superficial venous sub-system. Once more the lymphatic system differs here from the venous system in the poverty of channels between the superficial and the deep sub-systems. Trophic changes linked to vascular return deficiency, be it venous or lymphatic, are largely dependent on lymphatic control. This fact explains the good clinical outcomes identified when the treatment approach addresses the efficiency of the superficial circulation. Clinical signs present in vascular return insufficiencies are multiple and variable. Therefore, only the vascular deficiencies that do benefit from an adequate manual treatment are presented. The superficial inflammatory processes, skin ulcers example of skin ulcerthe same ulcer a few days of MLD, primary venous and lymphatic oedema example are all witnesses of vascular return insufficiency. The appropriate manual treatment relies before all on multi-faceted approaches since the efficiency of the treatment is based more on the coalition of the different approaches than on any single facet of the treatment. Acute phase of algodystrophy, s/p surgery immediate and acute oedemas as well as oedema secondary to oncology surgery are all indications for the manual treatment approach since all the aforementioned oedemas are of the superficial type. Post surgical oedema and primary lymphatic oedema (rare at this level) are the principal culprits of vascular return insufficiency (even interruption). Eventhough, all these facets of treatment are the core of our conservative approach a selective application of these modalities correlates to the different stages of the deficiency. The manual lymphatic drainage is eventually the sole aspect of the approach repeated all along the different stages.